The evil witch, Mortessa has destroyed the Elven Kingdom and turned nature itself against the Elves. After returning from a far country, princess Aerin finds her kingdom in ruins, monsters invading the streets and the citizens scared. 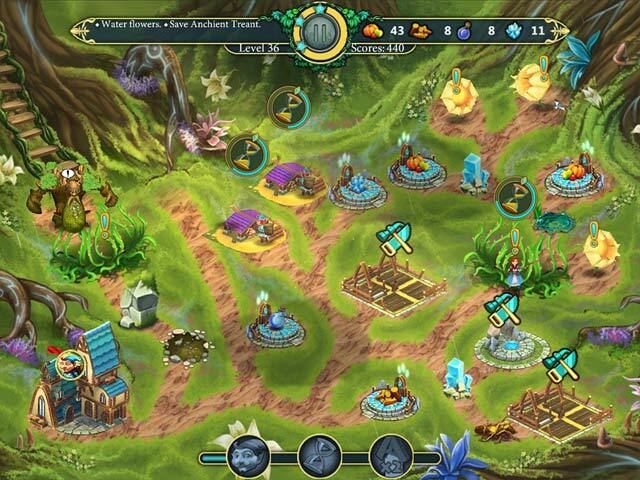 Help her rebuild the Kingdom and stop the witch in this time management adventure! 40 levels across 5 different locations! 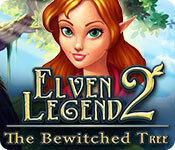 Elven Legend 2: The Bewitched Tree is rated 3.3 out of 5 by 17. Rated 5 out of 5 by graceland9 from Challenging and Magical I enjoyed playing this TM game, in which Lady Aerin rebuilds her kingdom after Morissa and an army of orcs have destroyed it. Aerin is helped by griffins, which was awesome. I'm all about griffins. There are really cool challenges like feeding the orcs, going underground, rebuilding mines and bridges... As usual, you have to collect resources and decide on the order of repair. 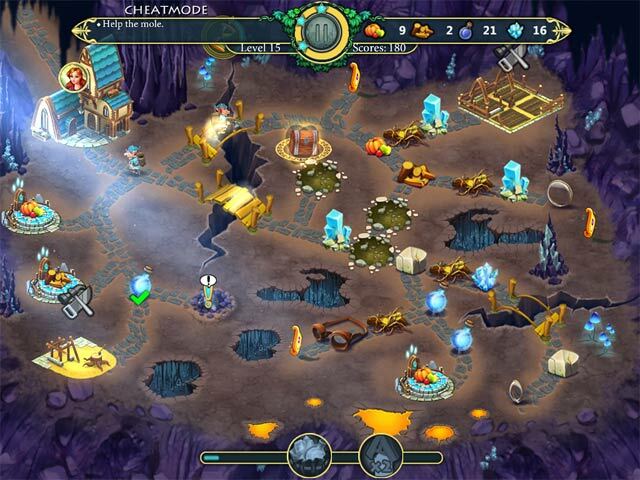 Some levels are tricky, so you might need to replay them - all adding to the challenge. As another reviewer said, I was confounded by the unnecessary cutscenes between most of (every?) level. Why? There was really no need for a little movie of what just happened or what was coming up next. Other games use graphics, which work just fine. I'd reconsider all those memory hogging cinematics if the developers come up with a sequel. Rated 5 out of 5 by Bettyelou from A fun game It is a funny game. without thinking to hard. Good way to pass the time. Good Graphics. Easy to understand. Rated 5 out of 5 by julie65608 from Elven Magic! This is a nice TM. Good graphics. Nice music. You can not click ahead on this game. It is a challenge. Traveling from village to village, you encounter all sorts of creatures. Some you cure.Some you help. Buildings are upgrade-able. You rebuild this kingdom little by little and restore order.Three levels of play make this a keeper for me. Fun little TM. Try it and see. Swim on fishes. Rated 5 out of 5 by pennmom36 from The Tree Of Life Has Been Bewitched! The only thing I didn't like about this Time Management game, was the constant interruptions of cutscenes, which are not only between levels, but within the levels themselves. At first I thought it was kinda cool that the story was unfolding as you were playing, giving meaning and explanation to the tasks you were accomplishing, but it did start to get old after a while and I found myself skipping through most of the cutscenes. On the other hand, this TM game has excellent graphics, really good layouts in each level with plenty of active areas to interact with. This isn't an easy breezy game however (unless you are playing in Relaxed mode which is untimed) and I will admit that I had to restart a few levels to "get it right" by slightly altering the order in which I queued my tasks, otherwise I had to waste time waiting for the necessary resources to be available because I used them on a different task that had more benefits. You can earn up to 3 stars in each level, but like I said, you will have to use strategy to earn all three stars. The Developer's score is shown on the map above each level, but beating the score of the person who designs the game and knows what should be done when and how seems impossible, so I didn't bother with that attempt. The goal is to help Lady Aerin restore her Elven Kingdom from the enchanted roots of The Tree Of Life, which are attacking the villages, farms and even the Capital Building. Some of the levels contain Gold Petals which are gathered just like a resource, these petals can be used to rebuild the Capital Building (which you get to choose the name for) but this feature is optional from what I gathered. There are the normal resources to collect, food, wood, stone etc. and the same tasks of clearing the roadways, repairing bridges and filling in pits along the way. Princess Aerin will do all the magic work, once she has enough magical crystals to charge her staff, but she gets a helping hand from a Healer who heals plants and animals, and her trusted Griffin has joined her once more to chase away the Trolls, once his house has been built of course. There are several Altars of Resources available in each level that will produce resources over a period of time and each level has a Bonus meter that recharges to give you temporary boosts such as faster workers, more resources, or extra workers. Enjoy! Rated 3 out of 5 by bessiegirl from not as good as the third I played this one timed/relaxed so I could accrue the stars. The relaxed level doesn't do that in this game. The timed/relaxed level gives you plenty of time. I was able to get 2 to 3 stars on almost every level. It was relaxed. The third game in this series is much better than this mostly because there is a bit more challenge and also because it doesn't have the really annoying and constant cut-scenes. This level is full of them and even though you can skip right through them, I found them really disruptive. I have all three of these this series. I can't remember the first one as it was purchased long ago, but my recommendation is now there is a 3 game, spend you money on it and forget this one....unless you can get it on sale and you feel you need the "set". Rated 3 out of 5 by TooOld2Play from Good Game for a Rainy Day Elven Legends 2 was my pick awaiting enough coins to buy the sequel which is CE right now. It isn't a bad game, it's just not that difficult. 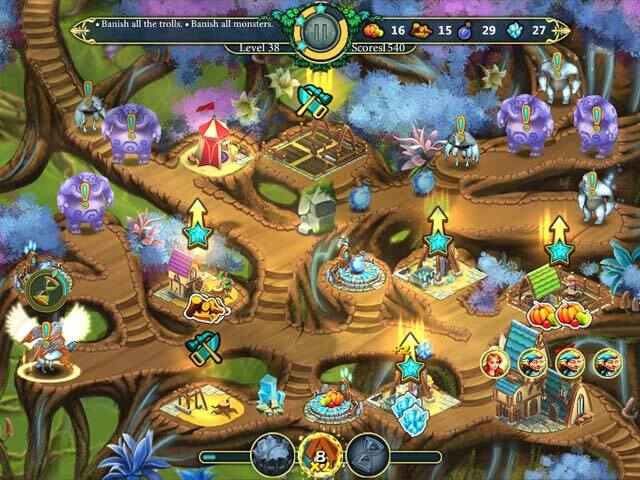 Seems it is very similar to another game, Save The Prince, which is so much harder. I played in normal timed mode. I may purchase Elven Legends 3. May. 40 levels, all easily accomplished at 3 stars for a novice, so if you are a whiz at TM games you may want to save this one for beginners. Rated 3 out of 5 by calculuscat3 from Cute game, but really needs a grammar check I enjoyed the game overall, and would have given it more stars were it not for a couple of really annoying issues. The placement of the cut scenes in the middle of the levels (or just after starting the level) was annoying. The grammar was also terrible. I understand if the developers are not native English speakers, but a good grammar check program (or hiring an editor) would have fixed most of the worst issues. The graphics were dated, but I do not mind that.